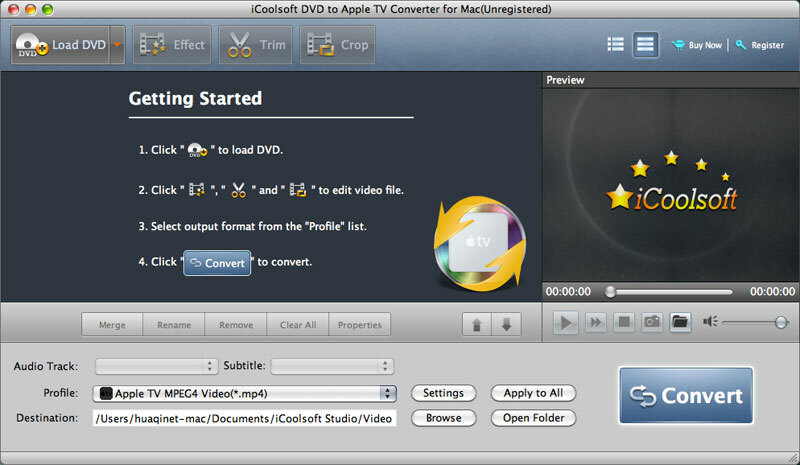 iCoolsoft DVD to Apple TV Converter for Mac can help you convert DVD movie to Apple TV supported MPEG-4, H.264 videos or MP3, AAC audio files. So that you can easily enjoy DVD movies on Apple TV. Beginners can use the built-in profiles to directly get Apple TV video or audio, while pro users can use the rich converting settings to customize the output video/audio quality and edit DVD movies to create personalized video. Have a try with iCoolsoft DVD to Apple TV Converter for Mac and backup your favorite DVD movies on Apple TV and watch them on television as many times as you want. Features: Convert DVD to Apple TV format on Mac This DVD to Apple TV converter Mac can help Mac users to convert DVD to Apple TV MPEG-4, H.264, MOV, M4V format or MP3, AAC, M4A, AIFF format. It works on Mac OS X v10.4, v10.5 and v10.6. Also support other devices Besides Apple TV, other digital devices are also supported, such as iPod, iPod nano, iPod classic, iPod touch, iPhone, iPhone 3G, etc. Optimize the output effect You can adjust video Brightness, Contrast, Saturation, and apply deinterlacing to improve the display effect. Powerful converting settings This tool can list all DVD titles and chapters for you to preview and choose, you are also allowed to select DVD audio track and subtitle for output videos. And you can set different output formats for the source videos. Edit DVD movies before converting to Apple TV You can set the start time and end time to specify any movie segment to convert, select several source files and join them into one file, crop the screen area to cut black edges or retain any part as you want, add text/image watermark to video and set its style, position, transparency, etc. Easy to use Use the ready profile to directly get Apple TV videos from DVD movie and this tool provides you with rich settings to customize the converting and edit DVD movies as you like. The interface is intuitive and no learning curve is needed. Top 4 Download periodically updates software information of iCoolsoft DVD to Apple TV Converter Mac 5.0.6 full version from the publisher, but some information may be slightly out-of-date. Using warez version, crack, warez passwords, patches, serial numbers, registration codes, key generator, pirate key, keymaker or keygen for iCoolsoft DVD to Apple TV Converter Mac 5.0.6 license key is illegal and prevent future development of iCoolsoft DVD to Apple TV Converter Mac 5.0.6. Download links are directly from our mirrors or publisher's website, iCoolsoft DVD to Apple TV Converter Mac 5.0.6 torrent files or shared files from free file sharing and free upload services, including Rapidshare, HellShare, HotFile, FileServe, MegaUpload, YouSendIt, SendSpace, DepositFiles, Letitbit, MailBigFile, DropSend, MediaMax, LeapFile, zUpload, MyOtherDrive, DivShare or MediaFire, are not allowed! Your computer will be at risk getting infected with spyware, adware, viruses, worms, trojan horses, dialers, etc while you are searching and browsing these illegal sites which distribute a so called keygen, key generator, pirate key, serial number, warez full version or crack for iCoolsoft DVD to Apple TV Converter Mac 5.0.6 download. These infections might corrupt your computer installation or breach your privacy. A keygen or key generator might contain a trojan horse opening a backdoor on your computer. Hackers can use this backdoor to take control of your computer, copy data from your computer or to use your computer to distribute viruses and spam to other people.